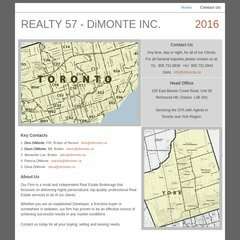 www.Dimonte.ca - REALTY 57 - DiMONTE INC.
dimonte.ca REALTY 57 - DiMONTE INC.
Its IP Number is 199.68.177.81. It is hosted by Pc Click (Ontario, Vaughan,) using Apache/2 web server. PING (199.68.177.81) 56(84) bytes of data. A time of 27.2 ms, is recorded in a ping test.